Asthma, Chest and Allergy Centre was founded by Dr. (Prof.) O. P. Jaggi, MD, Ph.D, former Director of V. P. Chest Institute, in the year 1992. 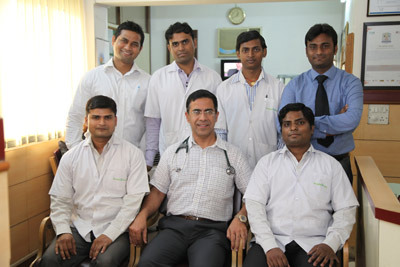 The AIM is to provide state-of-the-art diagnosis and treatment facilities for Asthma, Allergies and Chest diseases. It is envisioned as a Centre of Excellence providing not only the latest and the best of modern medicine but also scientifically proven alternative treatments like Yoga, Pranayama and dietary modifications for Asthma & Allergy, all under one roof. The Centre is a one of its kind clinic specializing in the treatment of Asthma, Allergies and chest diseases. Facilities include: Consultation, Full Laboratory Services, Pulmonary Function Testing, Allergy Testing, Allergy Desensitization, a strong patient education department, Asthma Club, Cough Clinic, Yoga & Pranayama Expert, Dietary Counseling, Asthma and Allergy Publications and a monthly E-newsletter.